I was in Gorak Shep, the last village before Everest base camp at 17,000′ with my fiancee, Carla, when the earthquake and subsequent avalanches hit. Our teahouse shook violently and we were soon thereafter hit by a powerful powder blast from an avalanche (likely from the flanks of Nuptse). The rest of my climbing team were ahead and arrived base camp as the earthquake and devastating avalanche struck. They were hit by the edge of the enormous powder blast (said to be moving at nearly 200mph) and survived its impact by ducking behind rocks and breathing through Buffs (a neck gaiter) to prevent the snow from entering their lungs. Our team leader, Willie Benegas, used his EMT training to help with triage at an improvised medical tent since the Himalayan Rescue Association’s ER tent was destroyed in the avalanche. My climbing partner, Matt Moniz, along with many others helped move the injured to the triage area throughout that afternoon and evening. Amazingly, the medical team treated 85 people that afternoon and evening. 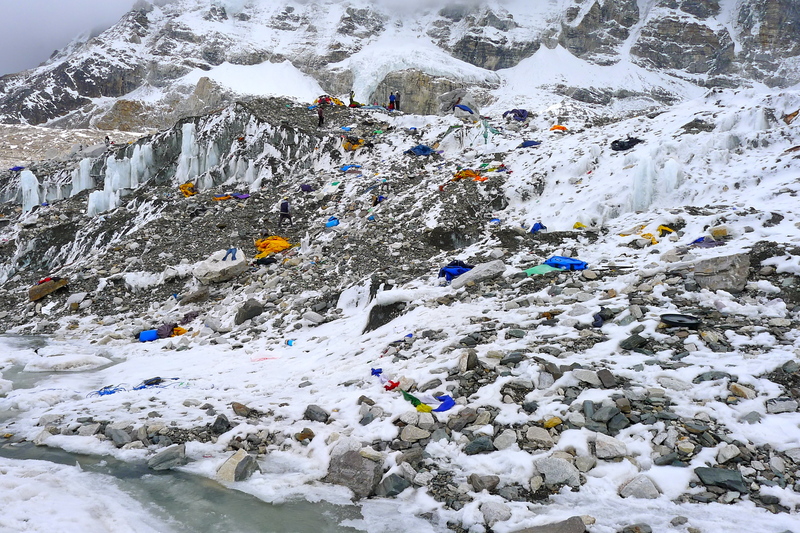 Sadly, there are 15 confirmed fatalities, many due to severe head injuries, with the potential for that number to climb a bit still, but many more lives would have been lost without the extraordinary and collaborative efforts of many at base camp. It was truly a heroic effort. I am thankful to report that of the many people I know at Everest base camp this season none were among the casualties. Feeling helpless in Gorak Shep, my fiancee and I finally heard from Willie and Matt at 5pm that they were alive and well and they told us of the devastation. We shepherded medical supplies there and departed at first light to bring additional supplies to base camp. That same morning all injured were evacuated via helicopter down valley for further treatment, starting with the most severely injured. All injured were evacuated by midday. The following day, resources shifted to bring down the ~170 climbers stranded at Camps I and II, above the dangerous Khumbu Icefall, since the route through the icefall was badly damaged due to the earthquake. Efforts to repair the route ceased due to the aftershocks and 2nd earthquake that made repairing the route untenable. All climbers in Camps I and II have been evacuated via helicopter as of today. Since the tragic events, many expedition teams have departed base camp to try to find their ways home. We have opted to remain here for the time being since we have lots of supplies and resources here. The tremendous and widespread destruction down valley and in Kathmandu lead us to believe that we are safer here for now. We hope to secure flights out of the country in the next 7-10 days and we will likely head down to Kathmandu to get to those flights only when necessary. As for a potential return to Everest, all I can say is that I can’t imagine returning anytime soon… but never say never. This was to be my 3rd attempt in the past 4 years. In 2012, my tentmate came down with a bad GI infection on the summit push and, not surprisingly, I fell ill 24 hours later and my summit attempt ended. Last year, the tragic serac collapse off the West Shoulder of Everest into the Khumbu Icefall that killed 16, ended the season on April 18th. My team climbed Cho Oyu, the 6th highest peak at 26,906′, as this occurred but our plans to climb Everest afterwards were thwarted by those tragic events. And then we have this year… so, perhaps summiting Everest is not in the cards, although I take away lessons from each of these attempts and have no regrets… only feelings of loss and sadness for the fallen and my Sherpa friends who have been so adversely impacted by these tragedies as well as feeling blessed that I have survived these events and have the opportunity to return home safely to my friends and loved ones. To ask for anything more, after all of these tragedies, would feel ungrateful, ungracious and petty. Walkley! The tragic news hit us as we were celebrating Olga and Vadims wedding in Riga. Gathered around was also Heidi, Arne and Anya, all from the 2012 expedition on which you were so unfortunate as to get ill at Camp II on our very summit attempt, nine weeks into the expedition. I felt bad for you then, I feel worse now. We were shocked and frantically started searching for news across the web. Luckily amongst all the chaos and tragedy we found you, Matt and Willie amongst our closest friends to be relatively safe. We can hardly fathom the magnitude of the impact on such a fragile country as Nepal is. The whole world is watching, in awestruck horror, the videos and photos that are being published from the Khumbu and Nepal in general, and we can only hope that you guys stay safe and can access a safe return home sometime soon. To all those not so fortunate we share our deepest condolences. Lars, what can I say. Thank you for the very kind words and for all of the well wishes. Very glad to have made it home safely and only wish that everyone had fared as well as we did. Thank you, Barbara. We are grateful to be home now and appreciate all that kept us in their thoughts and prayers. Hope you and Carla get home safely and as soon as possible. We look forward to celebrating your engagement when you return. Thanks, bro. Look forward to it. Thank you, John. We’re grateful to be home safely and only wish that all impacted fared as well as we did. Thank you, John. Greatly appreciated. Thanks for thinking of us. I hope you’re well.